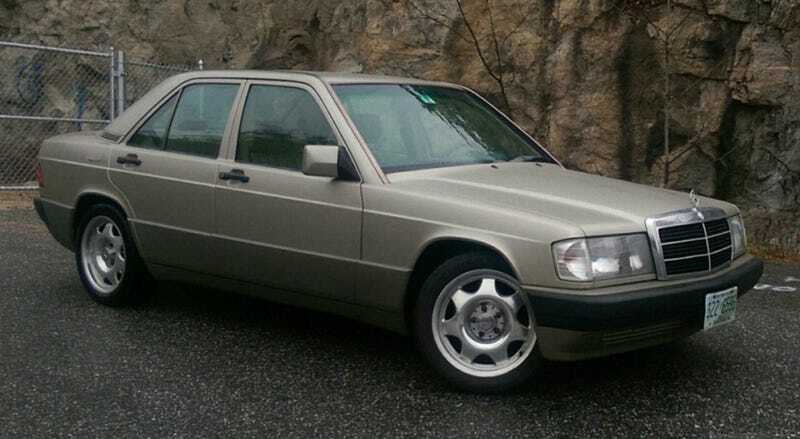 How About This Custom 3-Litre 1991 Mercedes Benz 190E For $3,750? Today’s Nice Price or Crack Pipe 190E rocks a three-point-oh, and was once featured on Bring a Trailer. You won’t have to bring a trailer full of money for it now, but you’ll still have to decide if it brings it at all. Let us for a moment contemplate all the things that Jalops in general hate. There’s lowered cars, slower’d cars, trailer hitches on slow, lowered cars, and of course, automatic transmissions. WE HATE automatic transmissions. And terrorism, I almost forgot freedom-sucking terrorism, we hate that too. Yesterday’s 1984 VW Jetta with its 1.6 diesel didn’t have an autotragic, and I don’t think it exhibited any terroristic tendencies. Unfortunately for its seller it was dropped a bit, and it’s most likely slow enough that you might as well walk it’s such a nice day. Because of those factors it engendered a wee bit of animus. That helped push its already questionable price well into Crack Pipe territory and it went down with a 72% loss. If that Jetta’s price left a sour taste in your mouth, but did pique your interest in small German sedans, then maybe you’ll kitten to this 1991 Mercedes Benz 190E. Yes, it’s a gasser, but it’s sort of a hot rod as somebody has put a 3.0 behind its three-pointed star. From the factory these cars maxed out at 2.6 litres, and those were only offered here in the U.S. with an automatic transmission. Remember, we hate those. This one rocks a five-speed stick backing up its M103.980 SOHC straight six. That, we like. Now the 1984 - 1993 W201 190 series was Mercedes’ first smallish sedan in almost two decades, and it was a range that the company itself now readily admits was wildly over-engineered. That engineering included the company’s complex five-link rear suspension, a design so inscrutable that it became a source of fascination for writer L.J.K. Setright who also deemed the 190 to be one of the best cars in the world. We like L.J.K. Setright too. This one looks to be clean, although the matte-finish “Plasti-dip” coating over the paint is a little weird. Okay, it’s a lot weird. The car comes with 150K on the chassis but only 75K on the engine. Part of that was apparently accomplished in an E-class. Polished CLK wheels and Euro lights dress things up a bit and work well with the still-handsome design. The ad notes that the suspension has been refreshed as has all the clutch bits and driveshaft carriers. The engine comes with a replaced head gasket an some other work, and overall the seller says that the car “functions as it should.” It also comes with a clean title, and a bunch of spare parts in case your garage isn’t crowded enough. The interior also looks pretty good, and I am constantly amazed at the durability of MB Tex, as even in the junkyard Mercedes’ seats almost always seem to hold up. The ad says that the A/C has been given the R134 treatment and that the heater core has been replaced. That’s a good thing as, if I recall correctly, that latter job entails the dismantling of the entire dashboard. The car was on eBay a month or so ago at a $4,000 BiN, and that ad was featured on BaT. The mythical BaT curse proved real in this instance, and the car didn’t sell at that price. Now it’s on Craigslist at $3,750 and it’s time for us to decide if it’s worth even that. What’s your take on this 3-litre, five speeder 190E with its plastic outside and fantastic inside? Does $3,750 seem like a fair deal as it’s described? Or, despite the bigger engine, does it need a still smaller price? New Hampshire Craigslist, or go here if the ad disappears.